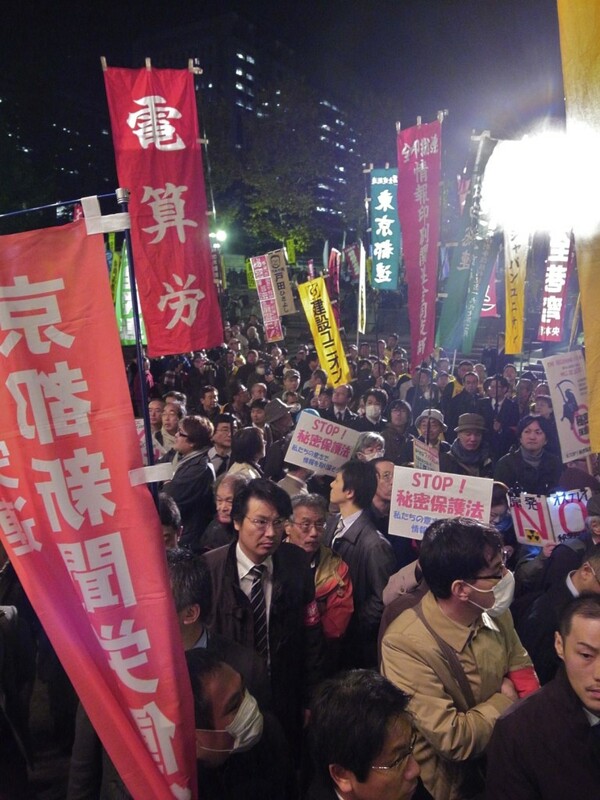 The tally yesterday came amongst cries of “This government has no conscience”, “Don’t make fools of the Japanese people” in a shouting match that was very close to a brawl. Meanwhile outside the Diet building over 1,000 protestors chanted opposition. Prime Minister Shinzo Abe (Liberal Democrat Party) is pushing the bill forward, despite a sudden dip in his support rates to below 50%. Earlier this week, the LDP Secretary General, Shigeru Ishiba, labeled the growing protests “tantamount to terrorism” which prompted more public outcry. The ruling parties had planned to hold an emergency vote on the bill in the middle of the night the same day, and make it law. They were forced to back down for another day by time stalling motions from the opposing Democratic Party of Japan (DPJ). If as part of their information gathering, a reporter or individual asks the wrong question about a designated secret to a public official, the police could call them in for voluntary questioning, and seize their laptop or smart phone. If they arrested him or her, the suspect could be held in detention for more than twenty days. It wouldn’t matter whether the individual knew they were asking about a secret or not. Prime Minister Abe’s Cabinet Intelligence and Research Office held the “background briefing on Special Intelligence Protection Bill” at 3pm Wednesday at the Central Government Offices in Tokyo. It is slightly unusual for the Abe administration to pay much attention to the views of the foreign press, yet the hard-hitting criticism of the foreign media has become hard for them to ignore. However, like Ishiba’s comments equating protestors with terrorists, the slightly menacing tone of the briefing announcement echoes the problems with the bill. Ironically, according to Japanese legal experts, under the current draft of the legislation, “impropriety” in newsgathering techniques involving state secrets can result in jail time. In theory, under the secrecy law, if the briefing had been declared a state secret, any unauthorized journalist writing about it could be found guilty of violations and sentenced up to ten years in prison. Any journalist who asked pointed and repeated questions about such a secret briefing, could also be arrested and tried for “instigating leaks” and sentenced up to five years in prison. Shimizu noticed that simply having their laptop seized or being called in for voluntary questioning would greatly intimidate most journalists. Cabinet officials have also stated that police raids on media outlets suspected to be involved in the leaking of secrets would be possible. It is not hard to see why the Abe cabinet is rushing to get the bill into law, even under the cover of night. The opposition continues to grow within Japan and overseas. Even the director of classics like Spirited Away, Hayao Miyazaki—the Walt Disney of Japan—came forward to express his concerns. The list of organizations and individuals expressing concern over the bill is far-reaching. They include Gakusha-no-kai, which is led by Nobel Prize laureate Hideki Shirakawa and Toshihide Masukawa plus 2000 scholars. There are also Japan’s: Newspaper Publishers & Editors Association, Commercial Broadcasters Association, Magazine Publishers Association, Book Publishers Association, Federation of Bar Associations. Even Navi Pillay, the U.N. High Commissioner for Human Rights expressed her fears. The bill is expected to be voted into law as early as tomorrow (December 6th). Over 50% of the Japanese population opposes the legislation and only 25% support it, according to the latest opinion polls. Designed by Kafka, Inspired by Hitler? Kafka would seem the most likely inspiration for this perplexing legislation but ruling coalition members acknowledge that another famous white man from the past may have provided the real inspiration for the bill and its implementation. The hawkish Prime Minister Abe has publicly stated his ambition to revise Japan’s constitution to rid it of Article 9, which forbids Japan from waging war. Upper house Diet member, Taro Yamamoto and others have publicly stated they believe the current bill is a stepping-stone to recreate a fascist Japan, as it existed prior to the Second World War. It might all seems like a bad joke, except for the Orwellian nature of the bill being proposed and a key Cabinet member expressing his admiration for the Nazis. Next Next post: Japan’s Secrecy Bill: Designed by Kafka & Inspired by Hitler?! !